When choosing an outdoor heating system or garage heater, consider Hanover's line of electric infrared heaters. 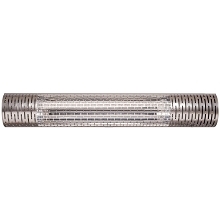 The Hanover halogen infrared heat lamp is highly effective for hanging from the ceiling or mounting to a wall. Use for your patio, porch, balcony, garage, workshop, and more! Similar to sunshine, infrared heat is a radiant heat that warms a person or an object directly, rather than heating the air in-between. Infrared heat can be felt instantly as soon as you turn it on – no waiting for it to “warm up”. In addition, an outdoor infrared heater saves energy by using less power to create the same amount of heat as traditional gas heaters and there is no smoke or fumes. Extend the use of your outdoor living space with a Hanover mountable infrared heater. 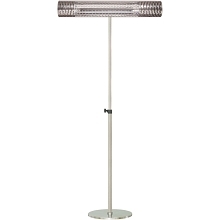 For portable heating, pair Hanover's stainless steel pole stand with one of our infrared heat lamps. 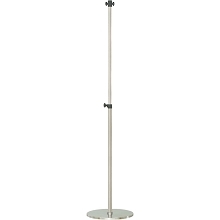 Hanover's sturdy pole stand has a weighted base and is adjustable from 45" to 80" so you can set it up to the exact height you need. 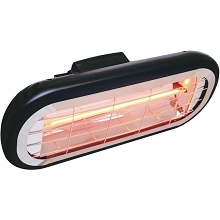 Compatible infrared heaters include HAN1031IC-SLV, HAN1051IC-SLV, and HAN1052IC-BLK. For all your outdoor infrared heater needs, choose Hanover. 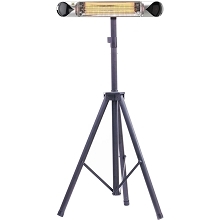 For portable heating, pair Hanover's tripod stand with one of our infrared heat lamps. 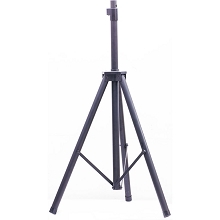 Hanover's sturdy tripod stand is adjustable from 43" to 70" so you can set it up to the exact height you need. Compatible infrared heaters include HAN1031IC-SLV, HAN1041IC-BLK, HAN1051IC-SLV, and HAN1052IC-BLK. For all your outdoor infrared heater needs, choose Hanover. 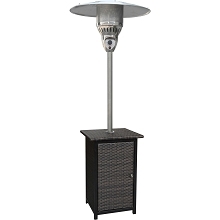 Surround your guests with the inviting 41,000 BTU heat of the Hanover wicker patio heater. It is a great addition to any patio for year-round outdoor comfort. With a variable control knob that ranges from low to high heat, this 7-ft. patio heater offers customizable comfort that can be utilized all year long. Cool summer nights and crisp autumn afternoons beckon for the casual elegance of the wicker-wrapped, steel constructed body with a 16.4-ft. heat radius. Choose from Black Wicker, or Brown Wicker with Stainless Accents to complete your outdoor sanctuary. When choosing an outdoor heating system or garage heater, consider Hanover's line of electric infrared heaters. Hanover's 30.7" wide carbon infrared heat lamp is the ideal choice for hanging from the ceiling or mounting to a wall. Use for your patio, porch, balcony, garage, workshop, and more! Similar to sunshine, infrared heat is a radiant heat that warms a person or an object directly, rather than heating the air in-between. Carbon infrared heat is a soft radiant heat that warms the skin efficiently. Infrared heat can be felt instantly as soon as you turn it on – no waiting for it to “warm up”. In addition, an outdoor infrared heater saves energy by using less power to create the same amount of heat as traditional gas heaters and there is no smoke or fumes. Extend the use of your outdoor living space with a Hanover mountable infrared heater. When choosing an outdoor heating system or garage heater, consider Hanover's line of electric infrared heaters. 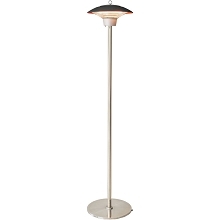 Hanover's 30.7" wide carbon infrared heat lamp includes a sturdy stainless steel pole stand with a weighted base. Use for your patio, porch, balcony, garage, workshop, and more! The stand is height adjustable from 45" to 80" and the heat lamp features two heat settings operated by a handy remote control. Similar to sunshine, infrared heat is a radiant heat that warms a person or an object directly, rather than heating the air in-between. Carbon infrared heat is a soft radiant heat that warms the skin efficiently. Infrared heat can be felt instantly as soon as you turn it on – no waiting for it to “warm up”. In addition, an outdoor infrared heater saves energy by using less power to create the same amount of heat as traditional gas heaters and there is no smoke or fumes. Extend the use of your outdoor living space with a Hanover infrared stand heater. When choosing an outdoor heating system or garage heater, consider Hanover's line of electric infrared heaters. 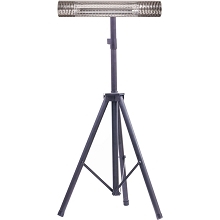 Hanover's 30.7" wide carbon infrared heat lamp includes a sturdy tripod stand. Use for your patio, porch, balcony, garage, workshop, and more! The stand is height adjustable from 43" to 70" and the heat lamp features two heat settings operated by a handy remote control. Similar to sunshine, infrared heat is a radiant heat that warms a person or an object directly, rather than heating the air in-between. Carbon infrared heat is a soft radiant heat that warms the skin efficiently. Infrared heat can be felt instantly as soon as you turn it on – no waiting for it to “warm up”. In addition, an outdoor infrared heater saves energy by using less power to create the same amount of heat as traditional gas heaters and there is no smoke or fumes. Extend the use of your outdoor living space with a Hanover infrared tripod heater. Surround your guests in the inviting 41,000 BTU heat of the Hanover round wicker patio heater. It is a great addition to any patio for year-round outdoor comfort. With a variable control knob that ranges from low to high heat, this 7-ft. patio heater offers customizable comfort that can be utilized all year long. Cool summer nights and crisp autumn afternoons beckon for the casual elegance of the wicker-wrapped, steel constructed body with a 16.4-ft. heat radius. Choose from Black Wicker, or Brown Wicker with Stainless Accents to complete your outdoor sanctuary. 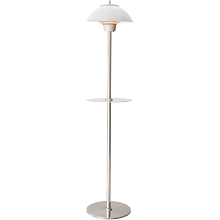 Enhance your outdoor dining or lounging area with this delightful Mini Umbrella tabletop heater from Hanover. 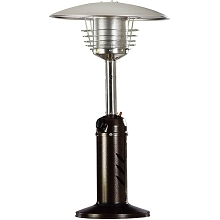 Approximately 35 inches tall, our mini umbrella liquid propane patio heater emits warm, radiant heat keeping you cozy and warm. Place it in the middle of your outdoor dining, coffee or end table to add that special touch to any occasion. Highly portable it can easily be moved from one table to another or better yet, buy two! When choosing an outdoor heating system or garage heater, consider Hanover's line of electric infrared heaters. Hanover's 34.6" wide carbon infrared heat lamp is the ideal choice for hanging from the ceiling or mounting to a wall. Use for your patio, porch, balcony, garage, workshop, and more! It features three heat settings operated by a handy remote control. Similar to sunshine, infrared heat is a radiant heat that warms a person or an object directly, rather than heating the air in-between. Carbon infrared heat is a soft radiant heat that warms the skin efficiently. Infrared heat can be felt instantly as soon as you turn it on – no waiting for it to “warm up”. In addition, an outdoor infrared heater saves energy by using less power to create the same amount of heat as traditional gas heaters and there is no smoke or fumes. Extend the use of your outdoor living space with a Hanover mountable infrared heater. When choosing an outdoor heating system or garage heater, consider Hanover's line of electric infrared heaters. 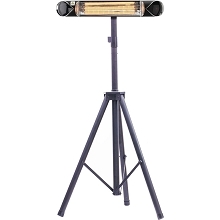 Hanover's 34.6" wide carbon infrared heat lamp includes a sturdy tripod stand. Use for your patio, porch, balcony, garage, workshop, and more! The stand is height adjustable from 43" to 70" and the heat lamp features three heat settings operated by a handy remote control. Similar to sunshine, infrared heat is a radiant heat that warms a person or an object directly, rather than heating the air in-between. Carbon infrared heat is a soft radiant heat that warms the skin efficiently. Infrared heat can be felt instantly as soon as you turn it on – no waiting for it to “warm up”. In addition, an outdoor infrared heater saves energy by using less power to create the same amount of heat as traditional gas heaters and there is no smoke or fumes. Extend the use of your outdoor living space with a Hanover infrared tripod heater. Get ready to entertain all year-long with an outdoor triangle propane heater. 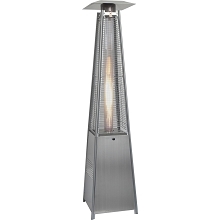 Standing at an impressive 7-ft. tall, this patio heater integrates sophisticated design with exceptional functionality and superior quality. 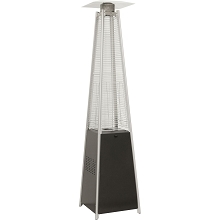 This sturdy, steel-constructed triangle heater projects a powerful 42,000 BTUs of heat within a 16.4-ft. heat radius. Perfect for those chilly nights outdoors, the battery ignition start adjusts from low to high heat suited to your liking. Choose from Hammered Bronze, or Stainless Steel to add the finishing touches to your outdoor décor. 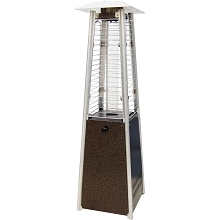 Prolong your outdoor entertainment season with a pyramid propane patio heater. 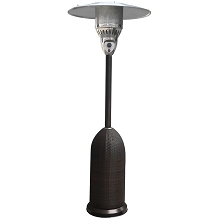 Its high-performing 42,000 BTUs of heat make this 7-ft. patio heater an essential addition to any patio. Featuring a simple, battery ignition start with adjustable low to high heat control, your guests can relax and unwind in the comfort of a 16.4-ft. heat radius. 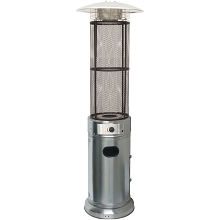 With a distinctive pyramid steel-constructed body available in either Black, or Stainless Steel finishes, this is a patio heater that will effortlessly enhance your backyard décor. When choosing an outdoor heating system or garage heater, consider Hanover's line of electric infrared heaters. 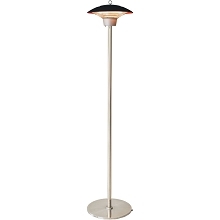 Hanover's halogen infrared heat lamp features a sturdy metal stand with a weighted base designed for use on your deck, patio, porch, balcony, and more. Similar to sunshine, infrared heat is a radiant heat that warms a person or an object directly, rather than heating the air in-between. Infrared heat can be felt instantly as soon as you turn it on – no waiting for it to “warm up”. In addition, an outdoor infrared heater saves energy by using less power to create the same amount of heat as traditional gas heaters and there is no smoke or fumes. Extend the use of your outdoor living space with a Hanover halogen infrared stand heater. 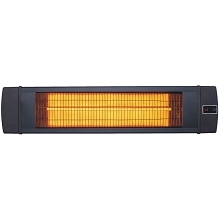 When choosing an outdoor heater, consider Hanover's line of electric infrared heaters. 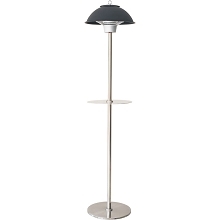 The Hanover carbon infrared heat lamp features a built-in table stand for setting your drinks on. Designed for open decking, open patios and other open air locations, it is perfect for outdoor parties and gatherings. Similar to sunshine, infrared heat is a radiant heat that warms a person or an object directly, rather than heating the air in-between. Carbon infrared heat is a soft radiant heat that warms the skin efficiently. Infrared heat can be felt instantly as soon as you turn it on – no waiting for it to “warm up”. In addition, an outdoor infrared heater saves energy by using less power to create the same amount of heat as traditional gas heaters and there is no smoke or fumes. Extend the use of your outdoor living space with a Hanover carbon infrared stand heater. Get ready to entertain all year-long with an outdoor triangle propane heater. 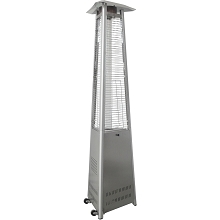 Standing at an impressive 7 ft. tall, this patio heater integrates sophisticated design with exceptional functionality and superior quality. The sturdy steel-constructed, triangle base projects a powerful 42,000 BTUs of heat with a 16.4-ft. heat radius. Perfect for those chilly nights outdoors, the battery ignition start adjusts from low to high heat control suited to your liking. Choose from the hammered bronze or stainless steel to add the finishing touches to your outdoor décor. Surround your guests in the inviting 41,000 BTU heat of the Hanover square wicker patio heater. It is constructed of durable steel and is available in brown wicker with stainless accents, or brown wicker with hammered bronze accents. Both styles offer a table-style design that will be multi-functional for your guests. Friends and family will have a place to rest their drinks while they make conversation and find ultimate comfort in your outdoor living space. The variable control knob ranges from low to high heat, allowing this 7-ft. patio heater to provide amazing comfort through all seasons. Take control your outdoor climate with the 7 ft. patio heater from Hanover. This model is perfect for those who enjoy hosting outdoor events. With a push of a button you can ignite the propane patio heater and instantly warm your guests with 41,000 BTUs of radiant heat. It features a state-of-the-art construction for outdoor endurance as well as a brown wicker base that coordinates well with existing décor. The base is made with outdoor-grade steel that protects the 20 lb. propane tank. Its square shape doubles as a convenient side table to rest beverages and other small items on. The top of the heater includes a control dial that allows you to adjust the heat output from Low to High settings. The steel and hardware are coated in a stainless steel finish for further protection and style. Enhance your outdoor dining or lounging area with this delightful Mini Pyramid tabletop heater from Hanover. Approximately 34 inches tall, our liquid propane patio heater emits a warm radiant glow creating comfort and beautiful ambiance in any outdoor setting. Place it in the middle of your outdoor dining, coffee or end table to add that special touch to any occasion. Highly portable it can easily be moved from one table to another or better yet, buy two! 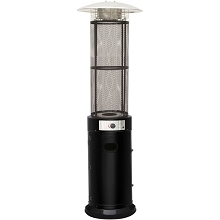 Enjoy the outdoors any time of the year with this 6-ft. patio heater by Hanover. Patio heaters are perfect for those who enjoy hosting outdoor events. 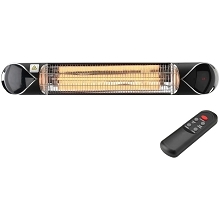 Simply ignite the propane patio heater and instantly warm your guests with 34,000 BTUs of radiant heat. It features a state-of-the-art construction for outdoor endurance as well as stainless steel materials that look great in any setting. The base conceals and protects the 20-lb. propane tank and includes a control dial that allows you to easily adjust the heat output from Low to High heat settings. Enhance your patio, deck or backyard oasis with Hanover’s collection of durable steel umbrella propane patio heaters. They are constructed of steel, ensuring that your investment will last for years while offering 41,000 BTUs of heat for your family and friends within a 16.4-ft radius. With a variable control valve to adjust temperature, this 7-ft. patio heater offers customizable comfort for the changing seasons. Available in Hammered Bronze, Autumn Bronze, Teal, Black, and Stainless Steel finishes, this is a patio heater that will seamlessly integrate into any backyard décor. Enhance your patio, deck or backyard oasis with a durable steel umbrella patio heater. With a variable control valve to adjust temperature, this 7-ft. patio heater offers customizable comfort for the changing seasons. It is constructed of steel, ensuring that your investment will last for years while offering 41,000 BTUs of heat for your family and friends within a 16.4-ft radius. 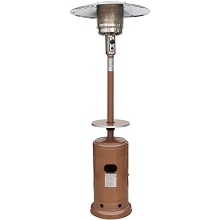 Available in Hammered Bronze, Bronze/Stainless, and Stainless Steel finishes, this is a patio heater that will seamlessly integrate into any backyard décor. When choosing an outdoor heating system or garage heater, consider Hanover's line of electric infrared heaters. Hanover's 35.4" wide carbon infrared heat lamp is the ideal choice for hanging from the ceiling or mounting to a wall. Use for your patio, porch, balcony, garage, workshop, and more! It features three heat settings operated by a handy remote control. Similar to sunshine, infrared heat is a radiant heat that warms a person or an object directly, rather than heating the air in-between. Carbon infrared heat is a soft radiant heat that warms the skin efficiently. Infrared heat can be felt instantly as soon as you turn it on – no waiting for it to “warm up”. In addition, an outdoor infrared heater saves energy by using less power to create the same amount of heat as traditional gas heaters and there is no smoke or fumes. Extend the use of your outdoor living space with a Hanover mountable infrared heater. When choosing an outdoor heating system or garage heater, consider Hanover's line of electric infrared heaters. 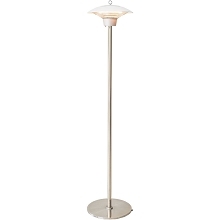 Hanover's 35.4" wide carbon infrared heat lamp includes a sturdy stainless steel pole stand with a weighted base. Use for your patio, porch, balcony, garage, workshop, and more! The stand is height adjustable from 45" to 80" and the heat lamp features three heat settings operated by a handy remote control. Similar to sunshine, infrared heat is a radiant heat that warms a person or an object directly, rather than heating the air in-between. Carbon infrared heat is a soft radiant heat that warms the skin efficiently. Infrared heat can be felt instantly as soon as you turn it on – no waiting for it to “warm up”. In addition, an outdoor infrared heater saves energy by using less power to create the same amount of heat as traditional gas heaters and there is no smoke or fumes. Extend the use of your outdoor living space with a Hanover infrared stand heater. When choosing an outdoor heating system or garage heater, consider Hanover's line of electric infrared heaters. 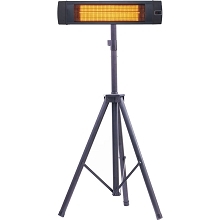 Hanover's 35.4" wide carbon infrared heat lamp includes a sturdy tripod stand. Use for your patio, porch, balcony, garage, workshop, and more! The stand is height adjustable from 43" to 70" and the heat lamp features three heat settings operated by a handy remote control. Similar to sunshine, infrared heat is a radiant heat that warms a person or an object directly, rather than heating the air in-between. Carbon infrared heat is a soft radiant heat that warms the skin efficiently. Infrared heat can be felt instantly as soon as you turn it on – no waiting for it to “warm up”. In addition, an outdoor infrared heater saves energy by using less power to create the same amount of heat as traditional gas heaters and there is no smoke or fumes. Extend the use of your outdoor living space with a Hanover infrared tripod heater. 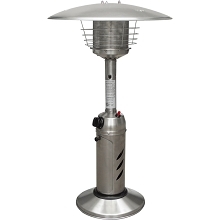 Enhance your patio, deck or backyard oasis with a durable steel umbrella patio heater. With a variable control valve to adjust temperature, this 7-ft. patio heater offers customizable comfort for the changing seasons. It's all-weather construction ensures that your investment will last for years while offering 41,000 BTUs of heat for your family and friends within a 16.4-ft radius. 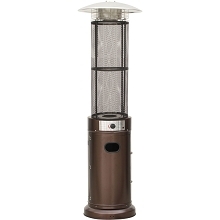 Available in Hammered Bronze, Bronze/Stainless, and Stainless Steel finishes, this is a patio heater that will seamlessly integrate into any backyard décor. Bask in the warmth of the 41,000 BTU square wicker patio heater. It is constructed of durable steel and is available in brown wicker with stainless accents, or brown wicker with hammered bronze accents. Both styles offer a table-style design that will be multi-functional for your guests. Friends and family will have a place to rest their drinks while they make conversation and find ultimate comfort in your outdoor living space. The variable control knob ranges from low to high heat, allowing this 7-ft. patio heater to provide amazing comfort through all seasons. Electrify your backyard scenery using a vibrant propane patio heater with stainless steel frame and multi-color LED lighted base. Your guests will revel in the coziness of 42,000 BTUs of heat within a 16.4-ft. radius. This 7-ft. patio heater offers amazing comfort throughout various seasons with a battery ignition start that adjusts from low to high heat. Perfect for the outdoor entertainer, the colorful LED base will amplify the mood for any occasion. 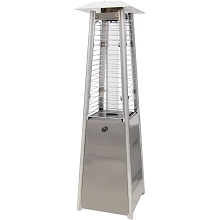 Prolong your outdoor entertainment season a pyramid propane patio heater. 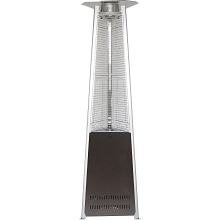 Its high-performing 42,000 BTUs of heat make this 7-ft. patio heater an essential addition to any patio. Featuring a simple, battery ignition start with adjustable low to high heat control, your guests can relax and unwind in the comfort of a 16.4-ft. heat radius. 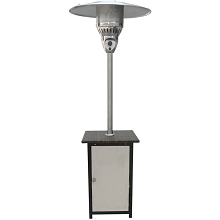 With a distinctive pyramid steel-constructed body available in either Black, or Stainless Steel finishes, this is a patio heater that will effortlessly enhance your backyard décor. 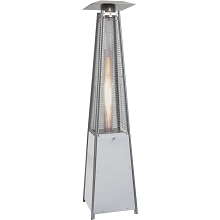 Enjoy the outdoors any time of the year with this 6 ft. patio heater by Hanover. Patio heaters are perfect for those who enjoy hosting outdoor events. 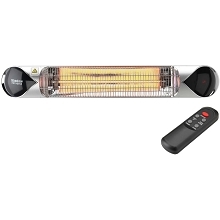 Simply ignite the propane patio heater and instantly warm your guests with 34,000 BTUs of radiant heat. It features a state-of-the-art construction for outdoor endurance as well as stainless steel materials that look great in any setting. The base conceals and protects the 20 lb. propane tank and includes a control dial that allows you to easily adjust the heat output from Low to High heat settings.